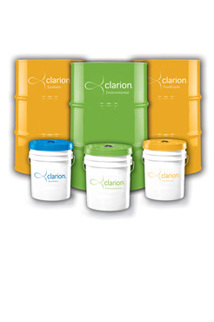 The Clarion team has learned how to optimize the chemistry that can now help reduce the environmental impacts of work, from pure white oils for food manufacturing to environmentally tuned lubes for marine operations - without sacrificing performance in any way. Clarion Lubricant performance in every specified regime is of maximum quality, because we focus on crystal-clear white mineral oil-based formulations, high-technology processing and rigorous testing. Clarion Synthetic, Food Grade, Environmental and Technical Grade products offer clear, safe, solutions that minimize impacts on our environment. See our product warranty.